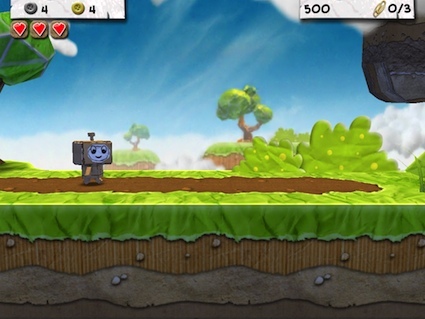 Side scrolling 2D games in a 3D world… we know them by appearance but not generally by that name. Run left/right with one hand, and jump with the other. On the iPad, these games do not require buttons, instead just tap the screen. 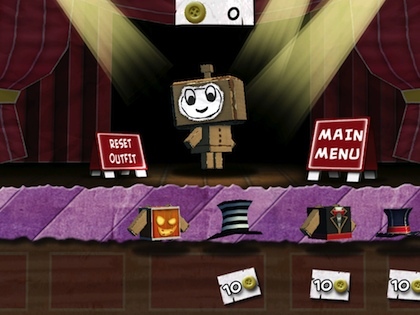 Paper Monsters is one of these games that we have been playing lately. A family game that can be played on the iPad or AirPlayed up to the TV screen for everyone to chuckle over a missed jump. 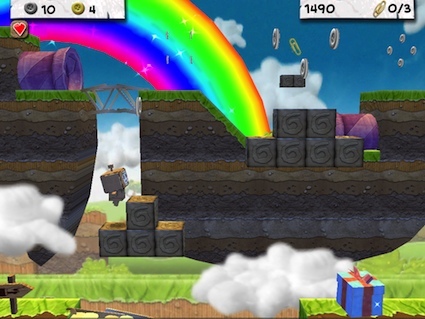 Paper Monsters are the cute square paper characters that can run, jump, gather buttons and coins through 6 worlds and 28 levels. Being a Universal app means that the game can continue across the different iOS devices when a household has a iPad, iPad mini, iPhone and iPod Touch. 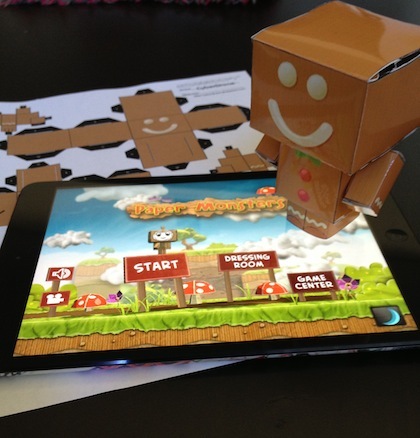 The fun can jump off the screen of the iPad into the real world. We found a lot of fun ‘cube’ cut outs on the Internet to download, print, cut and fold together. 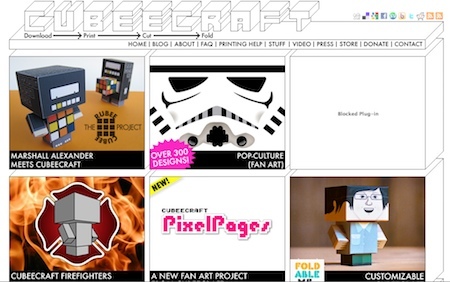 For the holidays, there are a bunch of fun ‘Cubees’ available. The Gingerbread person here is one of two Gingerbread Cubes, amongst other holiday elves and fun characters. Although these are free to download and print, the cut out details are really at a knife level rather than scissors so adults may be cutting for everyone else in the household to put together. A bit of imagination and the paper cubes can run in the real 3D world. These cube characters are not just holiday cubes. 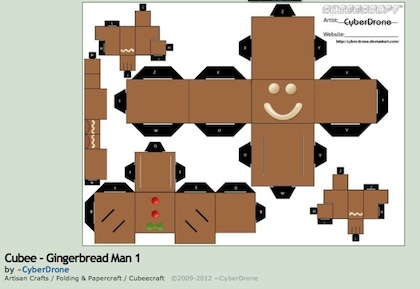 CubeeCraft has designs for holidays, favorite games and popular TV/Movies. There is even a couple Steve Jobs… which of course means we have a lot of those floating around the offices. If you turn the game over to the kids, there are in-app coins and buttons to purchase in exchange for dressing up their Cube Paper Monster. We didn’t see a lot of up-selling going on in the game but a couple clicks can result in a couple dollars being spent.